To say that Thomas Jefferson enjoyed wine would be an understatement. The time he spent in France as our American representative at the Court of Louis XVI from 1784 to 1790 gave him an opportunity to sample and learn about all of the great French wines. In 1787 he embarked on an extensive tour of Bordeaux and Burgundy, venturing into the great wine growing areas of Germany and Italy. He developed a taste for the very best and grew fond of many of the best wines of then and now, the Lafittes. the Margaux, the Haut Brions and the sweet elixir of the Gods, the Chateau d Y’quem. He had cases of his favorites shipped back to Washington. 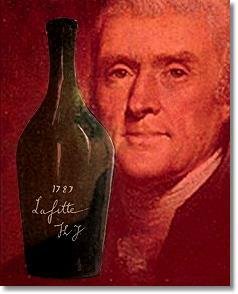 When Jefferson became President he spent much of his annual salary on the purchase of fine wines. He insisted on buying directly from the chateaus and not using the customary “negotiant” or middleman who at the time engaged in the practice of substituting lesser wines for the “first growths” that were ordered. Jefferson not only enjoyed the taste of the wines but was an ardent believer in the health aspects of wine. Several quotes on the subject of his passion for the grape are on record. Jefferson lived to the, remarkable for his time, age of 83 and there is little doubt he felt that wine played a key role in his longevity. As a fellow wine-geek it is comforting to know that a man who was so instrumental in the early development of our nation probably had a nice glass of Bordeaux by his side each night as he penned the words to our Declaration of Independence. For a more studied and intense view of Jefferson and his wines I would recommend “Thomas Jefferson on Wine” by John Hailman or “Passion: The Wines and Travels of Thomas Jefferson” by James M. Gabler. 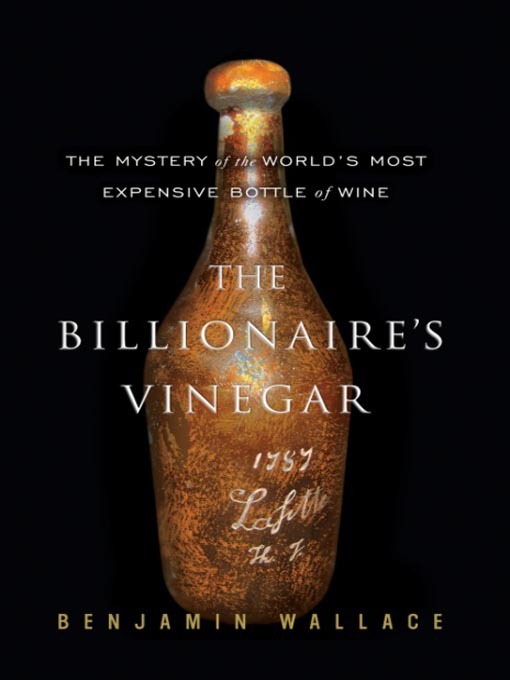 If you are more inclined to just enjoy an interesting story of mystery and intrigue concerning Jefferson and wine I highly recommend Benjamin Wallace’s “The Billionaire’s Vinegar”. It is safe to say that there is no longer simple speculation as to the health benefits of red wine. There have been a significant number of reports from medical professionals lauding the almost astounding results they have seen from tests that have been conducted throughout the world. It’s been nearly 200 years since researchers discovered what they called “the French Paradox”. How could it be that the French whose diet consisted of foods high in fats and cholesterol have such low incidence of heart disease? They now believe the answer may lie in some of the ingredients found in red wine and most of the research is pointing toward a polyphenol called RESVERATROL which is found in grape skins as the leading contributor to improved health effects. Red wine seems far more beneficial because the wine is allowed to stay with the skins longer than with white wine and thus absorbs more of the resveratrol from the skins. Scientists at the University of Queensland in Australia have done extensive studies of resveratrol and have announced that the weight of evidence supports two theories. Resveratrol kills cancer cells and protects heart cells. They are not totally certain how the compound is absorbed into the body but believe it is a cellular function. Hardly a month goes by without researchers finding additional health benefits in red wine. Researchers recently told the Annual Scientific Meeting of the American College of Gastroentology that drinking 3 glasses of red wine each week could reduce the incidence of colorectal cancer by almost 70%! Personally, I find much to enjoy in drinking red wine without these health benefits. It is encouraging though to think that I am also gaining important health benefits as a result of my love of wine. Maybe this is the sort of news you need to initiate your own entrance to the wonderful world of wines.